So let’s get one thing straight right from the start – I don’t read post-apocalypse books. Got that? Good. So… erm, what happened here? I made the mistake of reading the blurb, that’s what happened, and instantly I was hooked. That’s one powerful opening scene. Here’s the premise: there’s a massive comet hurtling towards the earth which is going to devastate the whole planetary surface, destroying not just civilisation but pretty much all life forms. There’ll then be a long perma-winter before plants start growing again. Humans are doomed, basically. But luckily, cryo-sleep technology has been invented, and there’s enough time (just!) to build some underground storage facilities, train up some carefully chosen representatives of humanity and shut them away in cryo-tanks for two hundred years. Joanna wakes up, right on cue, and finds that she’s the only survivor after a massive cave-in. So far, so intriguing, and this is right where the book starts, with the wake-up scene and slowly dawning realisation of the scale of the catastrophe. 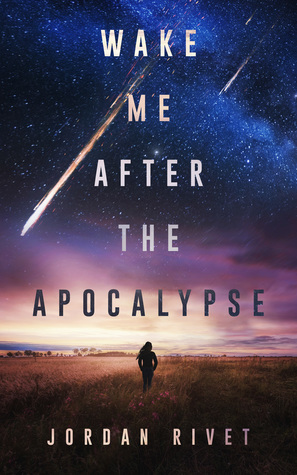 The first half of the book becomes the story of Joanna’s struggle to survive, to escape the caved-in underground facility and then settle on the surface, with the aim of eventually connecting with other cryo-survivors later. Interspersed with this compelling story is the frankly much duller story of what happened before doomsday – how Joanna was chosen to be part of the cryo-program, the training she and her cohort underwent, the crumbling of civilisation outside the gates and her slowly burgeoning romance with cheery team leader Garrett. But eventually the ‘before’ part of the story is told, and the focus narrows down to the much more dramatic ‘after’, and there are several moments here that are well worth the price of admission. I confess that one or two aspects I’d already sussed out, but not the whole of it, which gave the development of Joanna’s character an unexpected depth. On the other hand, I was looking for some convoluted plot-level chicanery behind the scenes and in the end it all turned out to be a bit simpler and (dare I say it) less interesting than I’d hoped. But that was just me looking for multiple layers of complexity, which perhaps may be developed in a later book, I don’t know. It reads perfectly well as a stand-alone, but I’d like to think that there’s more to come. A fun story with lots of dramatic twists and turns, some interesting character challenges, both physical and mental, a feisty female lead and hooray for a tale where obstacles are overcome by intelligence and creativity rather than responding first with violence. Four stars.